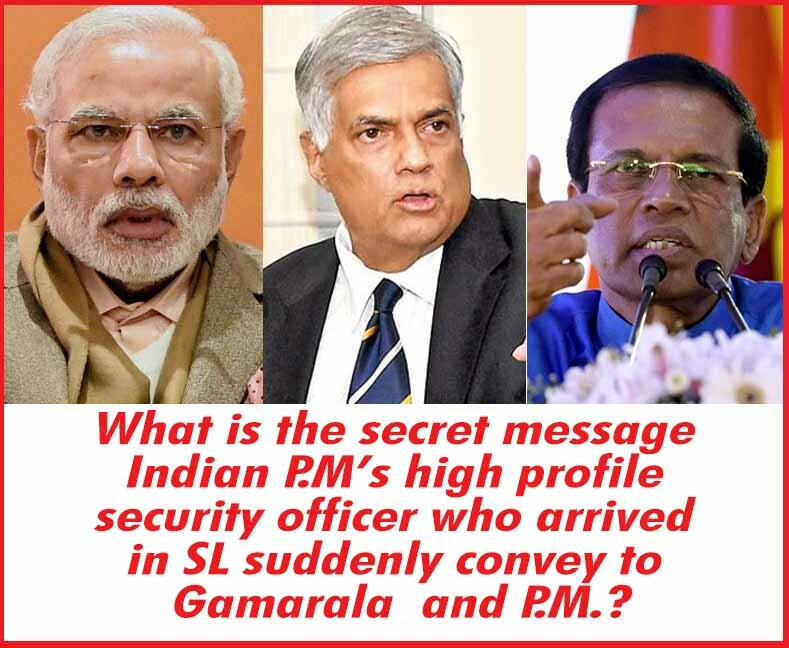 LEN - www.lankaenews.com | What is the secret message Indian P.M’s high profile security officer who arrived in SL suddenly convey to Gamarala and P.M.? (Lanka e News – 07.June.2018, 10.40AM) A high profile Indian intelligence division officer extremely close to Indian prime minister(P.M.) Narendra Modi arrived in SL on 4 th forenoon , and met with president Palllewaate Gamarala and Prime Minster Ranil Wickrmesinghe separately and secretly. On the same day after the discussions he left our shores ,based on reports reaching Lanka e News inside information division. Diplomatic circles are of the view that the officer suddenly arrived to convey a special warning message from Modi. Various powerful foreign forces are in operation in the country because the incumbent chief of the government himself is while being in the government is in the process of destabilizing the country during the last ten months. Among those are evil forces which are militating against India’s security .In the circumstances India has therefore alerted itself most intensely in this direction. On the last tour of India of our president , Modi told ‘you have not only put your own country in jeopardy but even mine’ direct to the face of Gamarala , which was reported by Lanka e News always first with news and best with the views , earlier on. This news report was not repudiated by India or SL.